In 2006 we campaigned hard to reopen the dormant branch railway line between Onehunga and Penrose once again to passenger services. Our 8,000 strong petition and support from the Auckland Regional Coucil saw the Government finally give the green light for funding on the 13 March 2007. The Onehunga branch line was one of the first Government funded railway lines in New Zealand, and it opened for the first time on Christmas Eve, 1873. Even in those days of steam, the very first trip from Auckland to Onehunga was made in just 22 minutes. The last Onehunga passenger rail service ran in April 1973. The branch line has been dormant ever since, save for the occassional charter train by a group of rail enthusiasts. With Onehunga local Garth Houltham acting as campaign manager, volunteers from the Campaign for Better Transport worked through the summer of 2005/2006 to gather over 8,000 signatures in support of reopening the line, mostly from local residents. The initiative was also strongly supported by the Onehunga Business community, in particular Dressmart and the Onehunga Business Association. The petition was presented to the ARC in May 2006 in the hope that its subsidiary the Auckland Regional Transport Authority would consider it as part of their ten year Passenger Transport Network Plan. The campaign was given a lifeline though in the form of Mike Lee, ARC chair and also Mark Gosche, at the time MP for Maungakiekie, through which the Onehunga line runs. The petition was presented to the Transport and Industrial Relations select committee in November 2006 for their consideration. 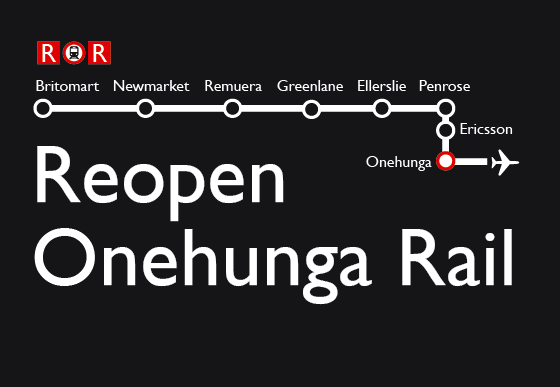 On the 13th March, Michael Cullen and Annette King jointly announced that the green light for the Onehunga line to be reopened, with a commissioning date given of December 2009 for passenger services. In the end it took a bit longer than that, with the line being officially opened by Steven Joyce and Mike Lee on the 18th September 2010.